﻿ Workers who had arrived work late against prompt arrival were seen prostrating for a governor, who had visited the state secretariat unannounced. What irked me was the description given to the photographs that the governor humiliated the workers, because the workers prostrated and begged the governor. Did the governor force the workers to prostrate as a condition for them to retain their jobs, or the workers chose prostration to beg to save their jobs? Amid those questions, I saved the photographs, which I had culled from Sahara Reporters, believing that people had made a wrong judgment in an environment, where a warped sense of judgment, seemed to have prevailed against normalcy. But when one of my children emailed the photographs to me with the same comment that the governor humiliated the workers, I quickly sent him a reply that it was the workers who humiliated themselves. I want to ensure that my son does not follow a pattern of ethics based on a warped sense of judgment. This is talking about the realm of ethics. It is not necessarily about 'rig'ht' or 'wrong,' but about how we have chosen to live and work expecting to earn deserved progress. Workers are expected to be diligent and prompt, and not turn to habitual late comers. Every employer expects employees to be prompt on their desk at resumption. It is normally part of organizations' code of conduct. A worker should be able to communicate any reason capable of keeping him from fulfilling his or her own side of the employment bargain to the employer, especially about arriving to work in time. Ayo Fayose, the Ekiti State governor in Nigeria must have heard about arbitrary late coming of workers before he decided to be at the gate to the secretariat to shock the workers that one day is for the thief, and one day is for the owner. The proverb adequately applies to employer and employee relationship, where the employee is not expected to cut corners or earn undeserved wage. 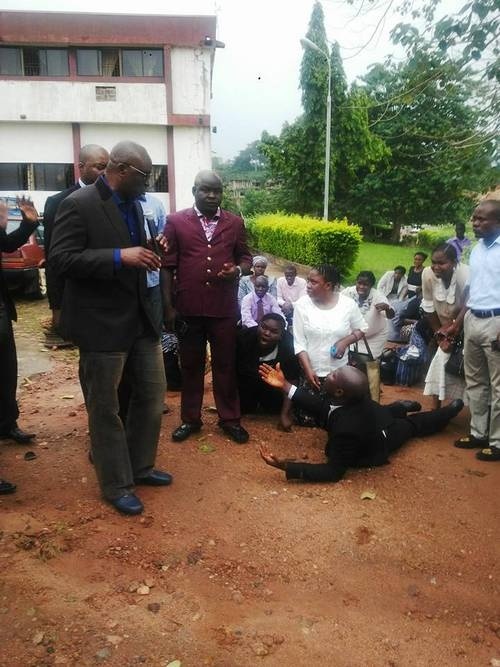 Fayose's appearance at the gate to the secretariat shocked the workers. Of course, they would not have expected it, because they live in a country lacking in accountability. And it is shocking that people in the media who should know what accountability is all about leads the crowd saying Fayose has humiliated the late coming workers. As they arrived late at the gate with qualm and without questions as they customarily do, made made the sudden appearance of Fayose at the gate a moral equivalent of trouble. The fear of losing their jobs must have been real and cannot be ruled out as part of what may have overcome them, threw themselves on the ground and prostrated their belly button touching the ground. My conclusion is that since the governor did not force the workers to prostrate, but the workers chose to prostrate to save themselves from a worse humiliation of losing their jobs, Fayose as a governor had done nothing wrong for working to make the state workforce to be alive to their responsibility. This is the message I sent to my son, for him to avoid the warped sense of judgment that Fayoe humiliated the workers rob on him, and for him not to believe that it is right to arrive late to work arbitrarily, without consequence.